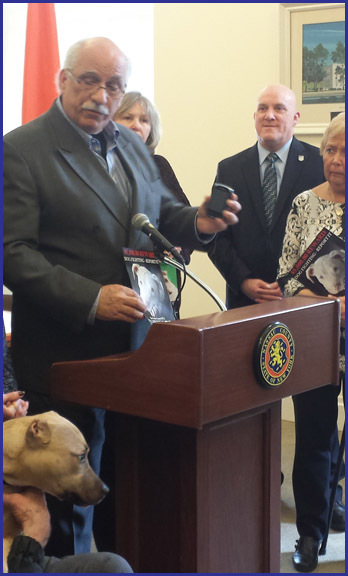 Nassau County Legislator Dennis Dunne, Sr. joined Nassau County Society for the Prevention of Cruelty to Animals (SPCA) President Robert Sowers, accompanied by Miss Harper, a brutally-injured puppy, and other Legislatorsto announce incentives for people who report incidents of animal abuse. A $5,000 dollar reward will be offered to anyone who reports an incident of dog fighting. Rewards of $1,000 will be offered to anyone reporting an incident of animal cruelty that leads to arrest and conviction. A new web site detailing the rewards will soon go live at www.nassaucountyspca.org/rewards. The Nassau County Society for the Prevention of Cruelty to Animals (SPCA) is a volunteer animal protection agency specifically authorized to uphold and enforce the state Agriculture & Markets Law, and all other state and local humane laws. NCSPCA is dedicated to the rescue, care and placement of needy animals. NCSPCA is the only animal protection agency officially designated to operate within the county's borders. The NCSPCA rescues, rehabilitates and provides care for animals that have been displaced or harmed. With the help of volunteers, law enforcement agents, rescue workers and veterinarians, NCSPCA is able to treat and find permanent homes for animals who have been abandoned, abused or neglected.